This is the third post in the Making the Most series. Just joining me? Catch up with making the most of your stuff and making the most of your space. I've mentioned before that I like clothes, and this is true. Yet, on typical days when I'm not teaching on campus, I find myself gravitating to the lowest common denominator in my closet: my favorite seven-year-old jeans and a tried-and-true gray tee shirt. Some people consider black as their go-to easy choice, but for me, it's gray all the way. If I didn't watch, I could spiral into 50 days of gray. So, I force myself to step out of that comfort zone by stepping into other clothes (ones that will be equally as comfortable) and adding at least one piece of interest to an outfit. Take this textured sweater, for example, coupled with a eye-catching belt and locket. 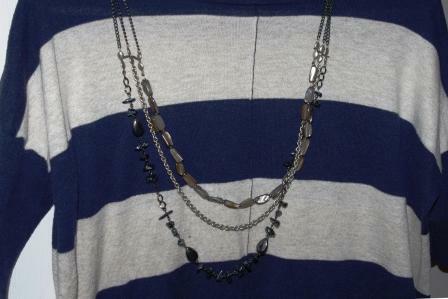 Or this thrift-store steal -- a cozy striped sweater that I pair with a chunky necklace. Still comfortable, still casual, but more pulled-together than my standard gray tee. 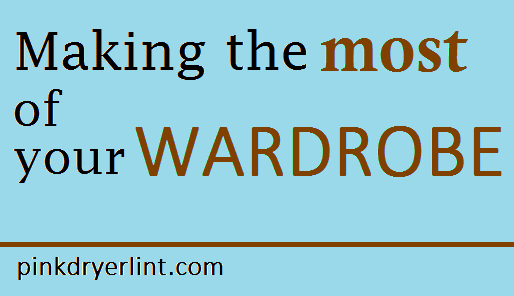 Want to make the most of your wardrobe? 1) Play in your closet. My daughters play dress up on a regular basis and rarely adhere to any rules about patterns or color combinations. Anything goes for little kids, fashion-wise, and we could learn by following this lead. Try on random combinations to discover what works and doesn't. There are probably great outfits lurking in your closet that just haven't been paired together yet. 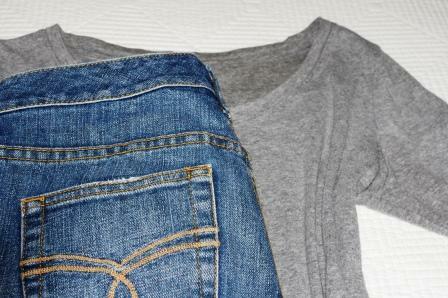 2) Donate clothes that you don't like and ones that don't fit. Take an honest inventory. It's better to have a partially-filled closet of clothes that make you feel attractive and fit properly than to have a closet crammed with poorly-sized, undesired clothes. I've heard this rule: if you haven't worn it in the past year (unless it's designed for a very special occasion), it's time to let it go. 3) Mend. I have a pair of gray dress pants (I've told you I like gray, right?) that fit perfectly -- except for the fact that they need to be hemmed. They've needed to be hemmed since I bought them six months ago. 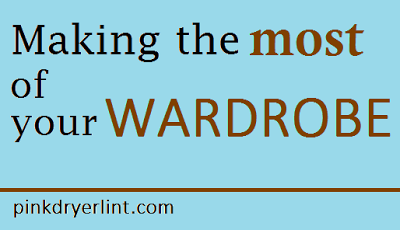 Do you have any items in your closet that are out of commission because they're missing a button or need tailored? If so, let's pledge to take care of it. I'll be hemming my pants this week. I've already got the gray thread. 4) Add an accessory. Last year I mounted small hooks in my closet to hang my jewelry. I'm much more apt to wear jewelry now that it's in plain sight. This is simple and cheap -- a package of cup hooks (screw or adhesive) can cost as little as two dollars. 5) Buy only what you love. I used to buy clothes based on the attractiveness of the price tag instead of the attractiveness of the item itself. A shirt on clearance for $3.99 sounds great, but that's only if you'll wear it. If you try on a piece of clothing, shrug at your reflection, and think, "I guess that'll do," then don't purchase it. Sure, clothes are clothes, but when you look good you feel good. After all, you're all the loveliest readers anyone could ask for, so I'd love for you to feel great about yourselves. 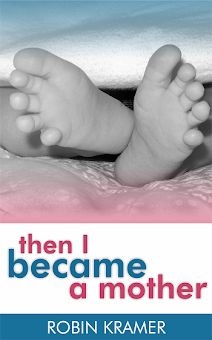 Please also check out Then I Became a Mother: humor, hope, and encouragement for moms! Available in both Kindle and paperback editions. Enjoy! I understand that draw to "sweats" comfy. Do you feel better/more productive when you're in real clothes? I don't know about productive....motivated maybe.